Cobra Speed Controllers are simple to program, and in most cases, they can be used right out of the package. Three of the Speed Controller parameters can be set without a programming card: Brake Mode, Battery Type, and Timing mode. The remaining parameters can be set with the optional ESC Programming Card, which is available separately. 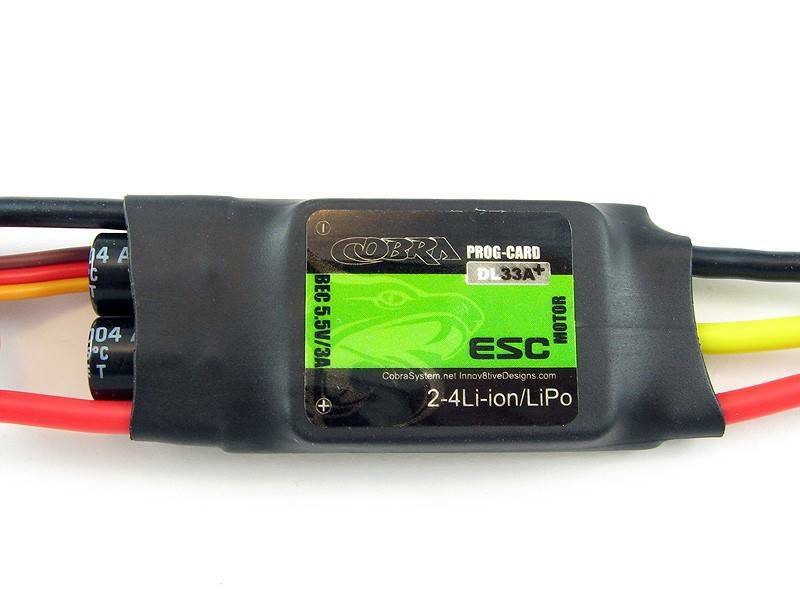 All of the Cobra Speed Controllers come with an internal BEC circuit to power your radio receiver and servos. The 11A and 22A models come with a 5.0 volt linear BEC rated for 2 amps of current. The 33A model comes with a 5.5 volt switching type BEC rated for 3 amps of current. The 40A, 60A, 80A, 100A and 150A models come with a 5.5 volt switching BEC rated for 6 amps of current to handle the power needs of the larger digital servos. The Cobra 33A ESC comes with a set of 3.5mm female bullet connectors already installed. These connectors match up with the ones provided on the Cobra Brushless motors as well as most other brands of brushless motors on the market today. Note: The Cobra speed controllers do NOT ship with the programming card. This part must be purchased separately. The same programming card is used for the entire series of Cobra speed controllers so only one programming card is needed for all of your Cobra speed controllers.